Mohabbat song Lyrics from Hindi movie Fanney Khan. Lyrics of Mohabbat is drafted by Irshad Kamil. Mohabbat song is sung by Sunidhi Chauhan. The Album features Aishwarya Rai Bachchan, Anil Kapoor, Rajkummar Rao in lead roles. Lyrics to Mohabbat song,Mohabbat song translation in english. 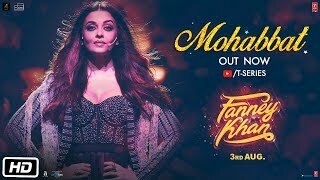 Mohabbat Song Lyrics from Fanney Khan movie starring Aishwarya Rai Bachchan, Anil Kapoor, Rajkummar Rao. This song is sung by Sunidhi Chauhan, music composed & produced by Tanishk Bagchi while Mohabbat Lyrics are written Irshad Kamil.